Can you believe Halloween is in 3 days? Even though I’ve been crafting Halloween edibles, like bloody teeth & spooky spider snacks, for weeks, I still can’t believe it’s here already. I also still can’t believe it’s ALMOST NOVEMBER, but that’s a different story entirely. To celebrate all Hallow’s Eve and the day of ghosts, ghouls and goblins, the theme for today’s #SundaySuppers was trick or treat! 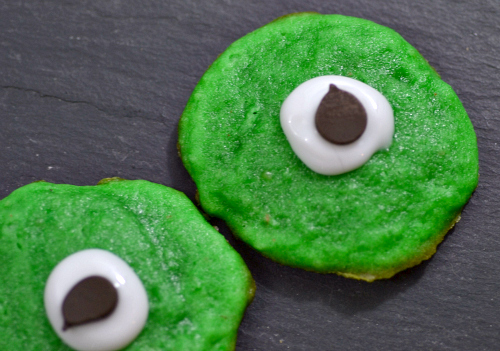 And nothing says trick, treat or Halloween quick like a batch of ogre eye cookies, am I right? 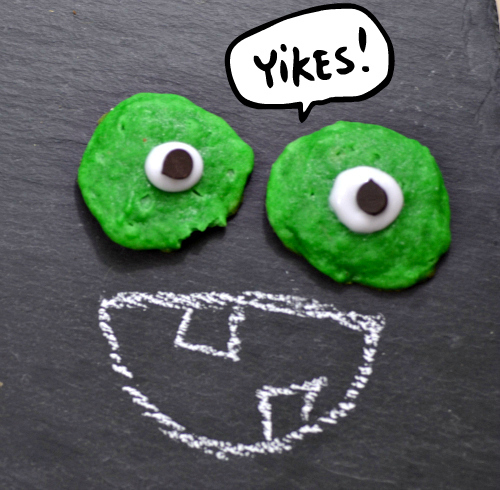 And you know what makes ogre eye cookies even more fun? CHALKBOARDS! I honestly can’t tell you how absurdly happy I was drawing weird ogre mouths to put underneath these cookies. I was giggling and snorting like a 6 year old. I mean, isn’t that kind of what Halloween is all about? It gives us adults a chance to act like complete weirdos, play with our food and eat candy all night without any guilt! I mean, I can’t even get over how much I love these, even if they turned out nothing like the original recipe they were based off. I’m really not sure who made these cookies look like that at My Recipes, but um, it’s darn near impossible. For one, any cookie batter with butter or applesauce needs to be chilled at least an hour before you handle it or else the cookies will turn out flat. Secondly, in order to handle the dough you need to flour your hands, which will then make the sprinkles less likely to stick. After one failed attempt at their method (and choice cuss words) I decided to do my own thing. For one, I added some green food dye to the dough to make it ogrey! Then, instead of rolling them into balls, I just made them regular drop cookies. Even though they aren’t AS cute as the others, I still LOVE them. They are an absolute breeze to make and are even more fun to play with. Plus, I made these with half applesauce so they are more moist and lower in fat! Your kids (or husbands) will love these, especially if you let them draw spooky mouths with chalk! Yields about 14 cookies. Recipe inspired by My Recipes. In a large mixing bowl, beat butter, applesauce and sugar together until creamed. Add in egg yolk and vanilla, stir until fully mixed. Gradually add flour (about 1/4 cup at a time) until fully incorporated. Add green food coloring until dough is bright green. Cover mixture with foil or saran wrap and chill for at least an hour. Once dough has chilled, preheat oven to 350 degrees F and grease a baking sheet with nonstick cooking spray. Scoop about 1 tablespoon of dough onto the sheets about 1 inch apart. Bake for about 8 – 10 minutes. (Cookies will be done with they spring back lightly when you touch them). Let cookies chill completely. Once chilled, use your white icing gel to make a large circle in the center of the cookie. Then, carefully press a mini chocolate chip in the center (to make the pupil). Then serve, play with and enjoy! Be sure to check out these other haunted inspired edibles for Sunday Suppers! LOL, love the ogre eye with the mouths! Super spooky, fun, and fabulous! And wouldn't you know I have some unsweetened apple sauce in my fridge that I need to use. 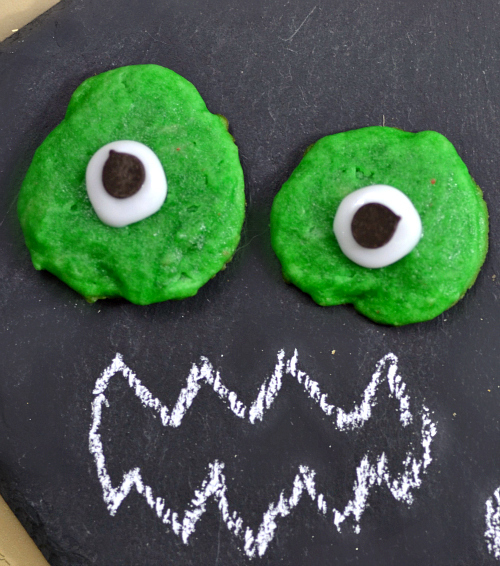 I'll have to make these fun cookies for Halloween. These are great. 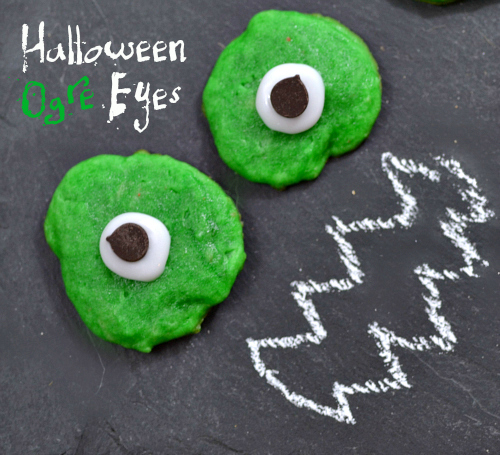 It's important to improvise - and you did a great job making these ogre eyes look like incredible halloween snacks! I am a big fan of chalk boards too - and marker boards, anything you can doodle on. Love it. These are so cute, Happy Halloween. Thanks for sharing on #SundaySupper. Creative and spooky ! Like the addition of applesauce and the way you decorated ! Love these! Fun and spooky! Happy Halloween, thanks for sharing! These are darling! Love them. Happy Halloween. This looks great! I will have to try it soon. Very creative! Love the chalkboard idea! Yours are much more ogrey than the original! Love the color! Looks very festive! Looked at the original recipe. Psshhh yours is better (and there is a chalkboard!!) Love the creativity! I never would have thought of them (or even doing them). Love this! and love that you went to plan B (sometimes better!) and it worked out beautifully or should I say ogrey delicious! :) Love it! Totally adorable. Er, can adorable be applied to ogres? I actually rolled out my cookies in bewteen two parchment papers so I didn't have to flour the counter or my hands. It worked out pretty well. Your cookies are too cute. Love your sense of humor. Snorting and all! I like your version of the eyes! Makes them more ghoolish! These are so cute! Very creative! These cookies are so cute-I know the kids would love them! These look great, Claire! And I love the idea of putting them on the chalkboard. When I did my Eyeball Pinwheels, I need some way to show them used as "eyes", but didn't even think of drawing on a chalkboard! Girl, these are super cute!! I think they are way better than the original! Love these. I have a googly eye obsession right now. I just can't help myself. They are so cute.